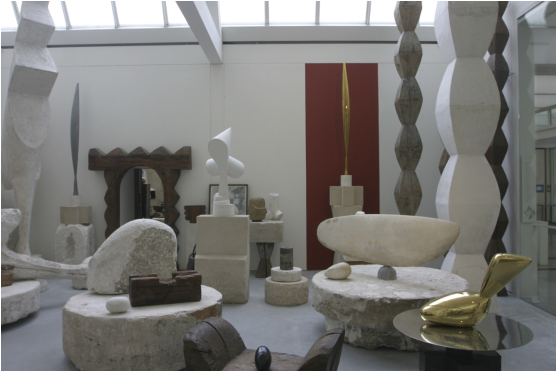 Whenever I have visitors to take around Paris, one of my favorite spots to visit is the Atelier Brancusi, on the square in front of the Centre Pompidou. 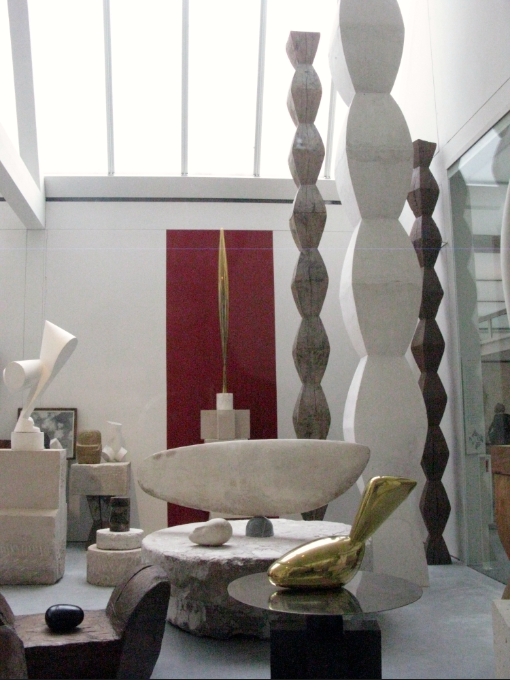 Romanian artist Constantin Brancusi (1876-1957) was the pioneer of abstract sculpture and a true revolutionary. 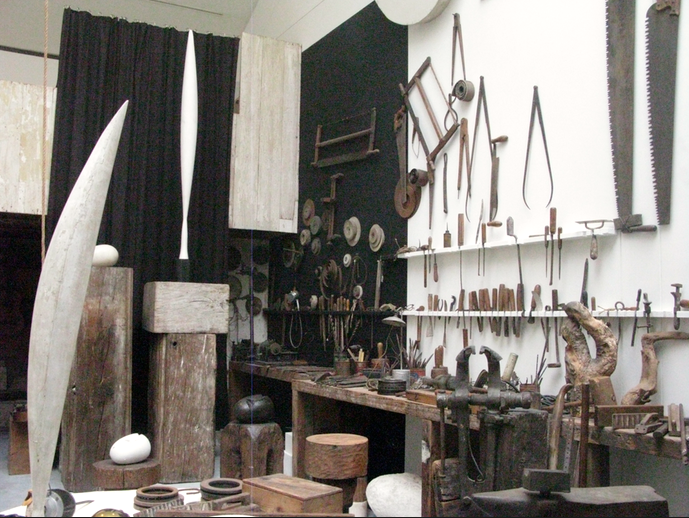 When he died he left his entire workshop to the French estate on condition that it be reconstructed as he left it. 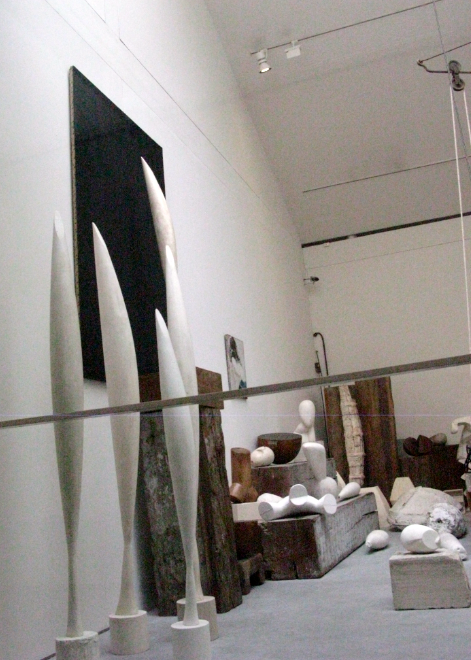 The atelier, a reproduction by the architect Renzo Piano of the series of studios that he worked and lived in in the 15 th arrondissement, features a unique collection of 137 sculptures such as Bird in Space, A Muse and Infinite Columns, Leda and Colonnes sans Fin, 87 pedestals, 41 drawings, 2 paintings and over a thousand glass plates and original photos by the artist. 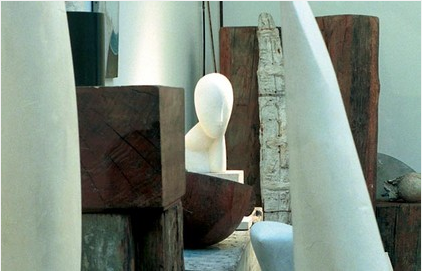 Brancusi was part of a group of artists and intellectuals that included Amedeo Modigliani, Pablo Picasso, Marcel Duchamp, Guillaume Apollinaire, Henri Rousseau and Fernand Leger. 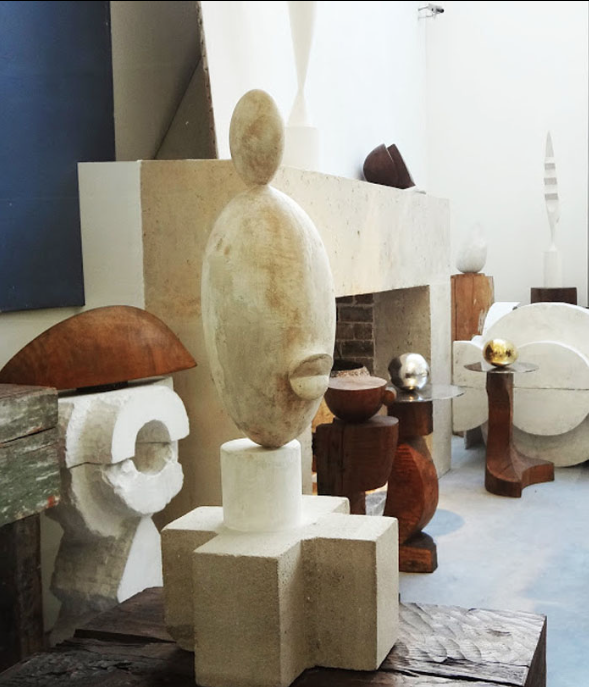 The works are in wood, plaster, stone, marble and metal; columns and streamlined bird forms or totems made of recovered beams from industrial sites. 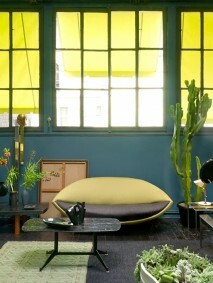 The atelier is surrounded by a glass wall which allows you to walk around the 4 rooms. Hanging on a wall by the forge are his tools, like objects of art. Pulleys with heavy ropes cut across from the ceiling giving you the physical scope of the work he did on some of the massive pieces. The combination of the earthy colors and organic shapes is soothing and sensual. The proportions are stunning, everything works together in a harmonious but well planned chaotic layout. The studio is a way of experiencing the artist’s best work. 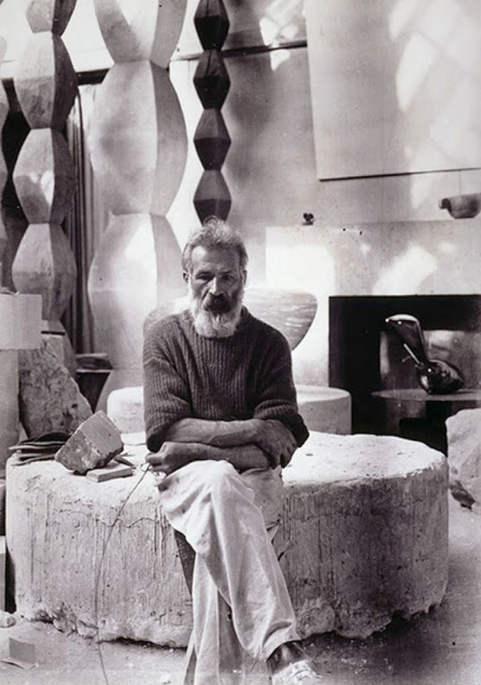 Towards the end of his life Brancusi stopped producing sculptures, preferring to concentrate on expanding and metamorphosing them within that space. 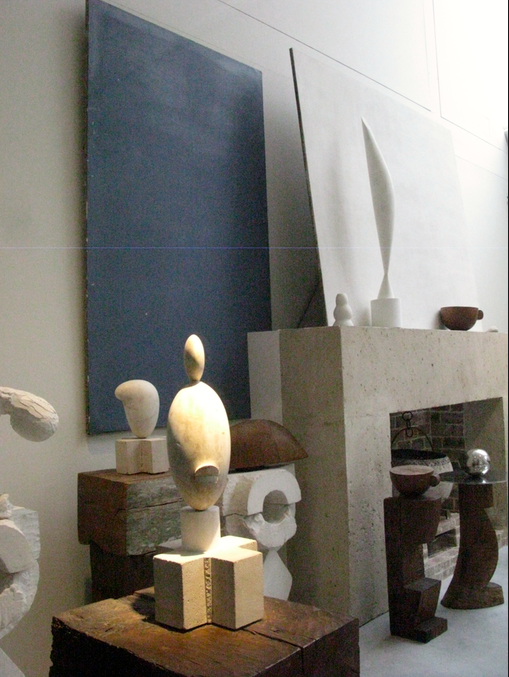 The proximity of the works to each other inside the studio space became so essential that in the 1950’s the artist refused to sell his work. 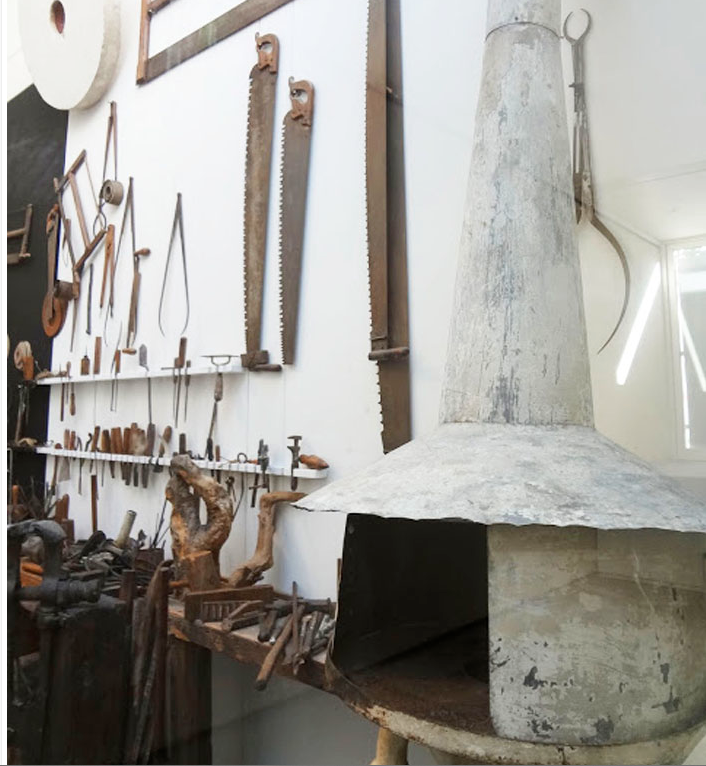 When he sold a piece he replaced it with a plaster cast so as not to forfeit the integitry of the whole, thus endowing the plaster with the importance of marble, spending his last years grouping, regrouping and photographing his large works to achieve the ideal spatial arrangement. 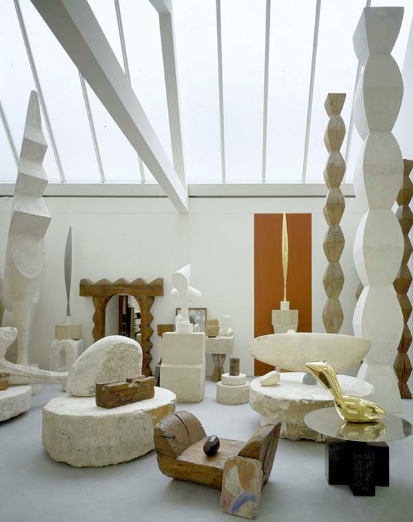 The Atelier Brancusi is the high-point of the artist’s work and an atmospheric way of viewing his famous sculptures exactly in the context he planned them to be seen. 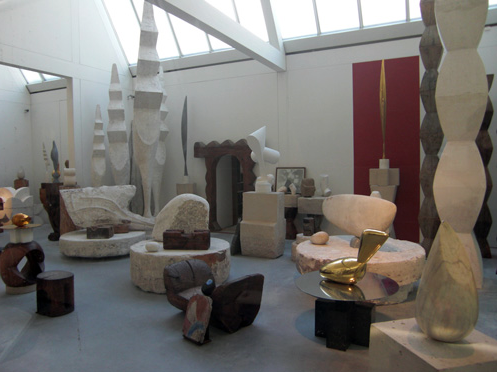 One of the great pioneers of modernism, he is considered the originator of modern, abstract sculpture. Just sit on a bench and take it all in. Open every afternoon between 2 and 6 pm, and it’s free.